Anti Aging: Barefoot SOS, Own Beauty, Andalou, Mad Hippie! • SOS Intensive Treatment Oil: SOS Intensive Treatment Oil is a nutrient-rich, nurturing and smoothing complex to nurture dry, dull skin. Repair blemished or scarred skin (even old chickenpox or acne scars or post-surgery). Smooth away wrinkles and fine lines and restore signs of UV-induced ageing and rosacea. Made with Rosa Mosqueta (20%), Argan and Evening Primrose Oils to soften the healthy complexion for brighter, rejuvenated skin and improve skin texture and elasticity. 1 oz. ORDER NOW! Ingredients: Squalane, Rosa Canina (Rosehip) Fruit Oil, Argania Spinosa (Argan) Kernel Oil, Oenothera Biennis (Evening Primrose) Oil, Tocopherol, Helianthus Annuus (Sunflower) Seed Oil, Rosa Damascena Flower Oil, Boswellia Carterii (Frankincense) Oil, Citronellol, Fusanus Spicatus (Sandalwood) Oil, Geraniol, Limonene, Eugenol, Linalool, Citral, Citric Acid. • Ultimate Youth Serum: Ultimate Youth Serum is a collagen-boosting treatment, containing Acmella Oleracea to help soften wrinkles and expression lines for 4-6 hours. Helps diminish blemishes and scarring (use in combination with Rosa Fina face & décolletage oil). Reduce appearance of redness, and appearance of enlarged open pores. Deeply firming Ultimate Youth Serum is enriched with strengthening Borage Oil and conditioning Lady's Mantle provides brighter, smoother skin. 0.5 oz. ORDER NOW! Ingredients: Aqua (Water), Rosa Canina (Rosehip) Fruit Oil, Glycerin, Hydrogenated Vegetable Glycerides, Borago Officinalis (Borage) Seed Oil, Macadamia Ternifolia Seed Oil, Xanthan Gum, Phenoxyethanol, Argania Spinosa Kernel Oil, Cetearyl Alcohol, Panthenol, Tocopheryl Acetate, Caprylyl Glycol, Sodium Stearoyl Glutamate, Alcohol, Citrus Nobilis (Mandarin Orange) Peel Oil, Allantoin, Thioctic Acid, Tocopherol, Limonene, Glyceryl Oleate, Fusanus Spicatus (Sandalwood) Oil, Lavandula Angustifolia (Lavender) Oil, Acmella Oleracea Extract, Boswellia Carterii (Frankincense) Oil, Rosa Damascena Flower Oil, Helianthus Annuus (Sunflower) Seed Oil, Calendula Officinalis Flower Extract, Tussilago Farfara (Coltsfoot) Flower/Leaf Extract, Linalool, Ascorbyl Palmitate, Alchemilla Vulgaris (Lady's Mantle) Leaf Extract, Pelargonium Graveolens (Geranium) Flower Oil, Citronellol, Citric Acid, Geraniol. • SOS Daily Replenishing Cream: SOS Daily Replenishing Cream is a deeply hydrating and toning cream to help firm the skin, reduce the appearance of fine lines and protect against the damaging effects of UV. Improve and maintain smooth, plump, healthy skin, leaving skin younger looking. Repair skin damaged by UV rays and pollution damage. Reduce scarring, blemishes and rosacea. Enriched with skin-regenerating Rosa Mosqueta Oil, nurturing Argan and Borage Oils and Vitamins A & E to boost collagen for a smoother, revitalized complexion. Suitable for all skin types, especially for mature/prematurely aged skin, dry skin, blemished skin, uneven skin tone, environmentally damaged skin. 1 oz. ORDER NOW! Ingredients: Aqua (Water), Helianthus Annuus (Sunflower) Seed Oil, Cetearyl Alcohol, Glycerin, Rosa Canina (Rosehip) Fruit Oil, Prunus Amygdalus Dulcis (Sweet Almond) Oil, Borago Officinalis (Borage) Seed Oil, Caprylyl Glycol, Glyceryl Stearate, Prunus Armeniaca (Apricot) Kernel Oil, Cetearyl Olivate, Cetearyl Glucoside, Sorbitan Olivate, Argania Spinosa (Argan) Kernel Oil, Ethylhexylglycerin, Panthenol, Tocopheryl Acetate, Canola Oil, Citrus Nobilis (Mandarin Orange) Peel Oil, Allantoin, Tocopherol, Limonene, Glyceryl Oleate, Fusanus Spicatus (Sandalwood) Oil, Lavandula Angustifolia (Lavender) Oil, Retinyl Palmitate, Boswellia Carterii (Frankincense) Oil, Rosa Damascena Flower Oil, Citronellol, Alcohol, Butylene Glycol, Calendula Officinalis Flower Extract, Tussilago Farfara (Coltsfoot) Flower/Leaf Extract, Linalool, Ascorbyl Palmitate, Alchemilla Vulgaris (Lady's Mantle) Leaf Extract, Pelargonium Graveolens (Geranium) Flower Oil, Geraniol, Daucus Carota Sativa (Carrot) Seed Oil, Daucus Carota Sativa (Carrot) Root Extract, Citric Acid, Beta-Carotene, Equisetum Arvense (Horsetail) Extract. • Light Moisturizing Lotion: Light Moisturizing Lotion is an easily absorbed and light-textured moisturizer supplemented with calming Calendula, enriching Meadowfoam Seed Oil and nurturing Rosa Mosqueta Oil for a softer and toned complexion. Improve and treat smooth, plump, healthy skin and reduce wrinkles and fine lines, leaving skin younger-looking. Restore skin damaged by UV rays/excessive use of sun beds, and reduce scarring, blemishes and rosacea. Perfect for normal or sensitive skin types to fortify the skin's barrier and protect against moisture loss and environmental damage. 0.95 oz. ORDER NOW! Ingredients: Aqua (Water), Oleyl Erucate, Glycerin, Cetearyl Alcohol, Rosa Canina (Rosehip) Fruit Oil, Helianthus Annuus (Sunflower) Seed Oil, Borago Officinalis (Borage) Seed Oil, Hydrogenated Vegetable Glycerides, Limnanthes Alba (Meadowfoam) Seed Oil, Prunus Amygdalus Dulcis (Sweet Almond) Oil, Phenoxyethanol, Argania Spinosa Kernel Oil, Panthenol, Sodium Stearoyl Glutamate, Ethylhexylglycerin, Tocopheryl Acetate, Xanthan Gum, Tocopherol, Allantoin, Citrus Nobilis (Mandarin Orange) Peel Oil, Limonene, Retinyl Palmitate, Fusanus Spicatus (Sandalwood) Oil, Lavandula Angustifolia (Lavender) Oil, Boswellia Carterii (Frankincense) Oil, Rosa Damascena Flower Oil, Alcohol, Butylene Glycol, Calendula Officinalis Flower Extract, Tussilago Farfara (Coltsfoot) Flower/Leaf Extract, Linalool, Alchemilla Vulgaris (Lady's Mantle) Leaf Extract, Pelargonium Graveolens (Geranium) Flower Oil, Citronellol, Geraniol, Equisetum Arvense (Horsetail) Extract, Hydrogenated Palm Glycerides Citrate, Citric Acid. WOMEN'S HEALTH/ANTI AGING: SOS Intensive Treatment Oil, 1 oz. WOMEN'S HEALTH/ANTI AGING: Ultimate Youth Serum, 0.5 oz. WOMEN'S HEALTH/ANTI AGING: SOS Daily Replenishing Cream, 1 oz. WOMEN'S HEALTH/ANTI AGING: Light Moisturizing Lotion, 0.95 oz. • Face & Body Rescue Cream: Multi award-winning, deeply rich and nurturing Face and Body Rescue Cream helps moisturize and calm all kinds of dry, sensitive, irritated and problem skin. Help control patches of eczema, psoriasis and dermatitis, offer extra moisture for elbows and knees, and moisturize wind-chapped or sun-damaged skin. Support withdrawal of steroid creams, and treat quickly and effectively with allergic flare-ups. Made with Stellaria (Chickweed) and Burdock Botanical Extracts to cool, comfort and calm irritation. Macadamia and Evening Primrose Oils intensely hydrate and repair parched skin. Purslane Botanical Extract helps soften and protect dry skin. Pure Essential Oils of Neroli and Chamomile gently nourish the skin with a soft aroma. Suitable for all ages, even babies. • Face & Body Rescue Cream: 3.3 oz. ORDER NOW! 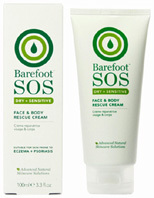 • Face & Body Rescue Cream: 1.65 oz. ORDER NOW! • Face & Body Rescue Cream: 0.83 oz. ORDER NOW! Ingredients: Aqua (Water), Cetearyl Alcohol, Helianthus Annuus (Sunflower) Seed Oil, Macadamia Ternifolia Seed Oil, Glycerin, Caprylic/Capric Triglyceride, Glyceryl Stearate, Pentaerythrityl Distearate, Simmondsia Chinensis (Jojoba) Seed Oil, Squalane, Theobroma Cacao (Cocoa) Seed Butter, Oenothera Biennis (Evening Primrose) Oil, Butyrospermum Parkii (Shea) Butter, Phenoxyethanol, Cetearyl Glucoside, Sodium Stearoyl Glutamate, Lactobacillus/Portulaca Oleracea Ferment Extract, Xanthan Gum, Ethylhexylglycerin, Limonene, Alcohol, Allantoin, Calendula Officinalis Flower Extract, Panthenol, Canola Oil, Citrus Aurantium Amara (Bitter Orange) Flower Oil, Stellaria Media Extract, Arctium Lappa Root Extract, Linalool, Lavandula Angustifolia (Lavender) Oil, Citrus Grandis (Grapefruit) Peel Oil, Anthemis Nobilis Flower Oil, Daucus Carota Sativa Seed Oil, Geraniol, Daucus Carota Sativa Root Extract, Citronellol, Caprylyl Glycol, Hydroxycitronellal, Citral, Aloe Barbadensis Leaf Juice, Beta-carotene, Chlorphenesin, Tocopheryl Acetate, Butylene Glycol, Hexylene Glycol,Citric Acid. • Daily Rich Body Lotion: Silky smooth Daily Rich Body Lotion provides daily nurture and moisture to dry and sensitive skin, and maintain soft supple skin. Light-textured formula makes this the ideal remedy for all-over body application to soothe and renew extremely dry and sensitive skin. Made with Stellaria (Chickweed) and Mallow Botanical Extracts to cool and calm sensitive areas, Shea Butter helps protect against the elements. 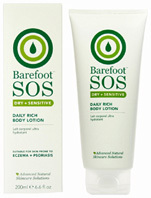 Jojoba, Argan and Macadamia Oils helps nurture and replenish extremely dry skin. Pure Essential Oils of Orange Blossom and Lavender produce a uplifting and soothing aroma. Experience its silky smooth, easily absorbed texture. Suitable for all ages, even babies. 3.3 oz. ORDER NOW! Ingredients: Aqua (Water), Cetearyl Alcohol, Helianthus Annuus (Sunflower) Seed Oil, Macadamia Ternifolia Seed Oil, Glycerin, Caprylic/Capric Triglyceride, Glyceryl Stearate, Pentaerythrityl Distearate, Simmondsia Chinensis (Jojoba) Seed Oil, Squalane, Theobroma Cacao (Cocoa) Seed Butter, Butyrospermum Parkii (Shea) Butter, Argania Spinosa Kernel Oil, Cetearyl Glucoside, Caprylyl Glycol, Citrus Grandis (Grapefruit) Peel Oil, Oenothera Biennis (Evening Primrose) Oil, Sodium Stearoyl Glutamate, Lactobacillus/Portulaca Oleracea Ferment Extract, Limonene, Alcohol, Caprylhydroxamic Acid, Allantoin, Calendula Officinalis Flower Extract, Panthenol, Canola Oil, Stellaria Media Extract, Citrus Aurantium Amara (Bitter Orange) Flower Oil, Arctium Lappa Root Extract, Linalool, Lavandula Angustifolia (Lavender) Oil, Anthemis Nobilis Flower Oil, Daucus Carota Sativa Seed Oil, Geraniol, Daucus Carota Sativa Root Extract, Citral, Citronellol, Phenoxyethanol, Hydroxycitronellal, Aloe Barbadensis Leaf Juice, Beta-Carotene, Chlorphenesin, Tocopheryl Acetate, Butylene Glycol, Hexylene Glycol, Citric Acid. • Soothing Face & Body Wash: Gentle, non-foaming creamy SOS Soothing Face & Body Wash to cleanse, hydrate and soothe sensitive skin in one go. Eliminate tautness and itchiness and promote skin that is clean, refreshed, soft and smooth. Made with Evening Primrose and Jojoba Oils to intensely moisturize and soften dry areas. Panthenol (Vitamin B5) and Allantoin help condition and calm the skin, Stellaria (Chickweed) and Burdock Botanical Extracts cool and soothe irritated skin. Pure Essential Oils of Geranium and Lemon Tea Tree create an revitalizing fragrance. Suitable for all ages, even babies. 6.6 oz. ORDER NOW! Ingredients: Aqua (Water), Cetearyl Alcohol, Glycerin, Glyceryl Stearate, Cetearyl Glucoside, Caprylic/Capric Triglyceride, Pentaerythrityl Distearate, Simmondsia Chinensis (Jojoba) Seed Oil, Phenoxyethanol, Disodium Coco-Glucoside Citrate, Xanthan Gum, Sodium Cocoyl Glutamate, Betaine, Oenothera Biennis (Evening Primrose) Oil, Lactobacillus/Portulaca Oleracea Ferment Extract, Alcohol, Citrus Nobilis (Mandarin Orange) Peel Oil, Allantoin, Ethylhexylglycerin, Panthenol, Squalane, Leptospermum Petersonii Oil, Limonene, Citral, Stellaria Media Extract, Lavandula Angustifolia (Lavender) Oil, Arctium Lappa Root Extract, Pelargonium Graveolens Flower Oil, Linalool, Citrus Aurantium Amara (Bitter Orange) Flower Oil, Citronellol, Anthemis Nobilis Flower Oil, Caprylyl Glycol, Chlorphenesin, Tocopherol, Butylene Glycol, Hexylene Glycol. WOMEN'S HEALTH/ANTI AGING: Face & Body Rescue Cream, 3.3 oz. WOMEN'S HEALTH/ANTI AGING: Face & Body Rescue Cream, 1.65 oz. WOMEN'S HEALTH/ANTI AGING: Face & Body Rescue Cream, 0.83 oz. WOMEN'S HEALTH/ANTI AGING: Daily Rich Body Lotion, 6.6 oz. WOMEN'S HEALTH/ANTI AGING: Soothing Face & Body Wash, 6.6 oz. • Exfoliating Serum: Alpha hydroxy acid based Exfoliating Serum helps reduce the appearance of skin discoloration & wrinkles. Made with Alpha Hydroxy Acids, Peptides and Apple Stem Cells to help shed dull, damaged skin and discoloration to reveal brighter, smoother skin. 1.02 oz. ORDER NOW! Ingredients: Water, Glycolic Acid, Hydrolyzed Vegetable Protein PG-Propyl Silanetriol, Vitamin B5 (Panthenol), Lactic Acid, Matrixyl Synthe ' 6 (Glycerin-Water(Aqua)– Hydroxypropyl Cyclodextrin–Palmitoyl Tripeptide-38), Vitamin C (Sodium Ascorbyl Phosphate), Potassium Hydroxide, Niacinamide, Sodium Hyaluronate, White Tea Extract (Camelia Sinensis), Goji Berry Extract (Lycium Barbarum), Polysorbate 20, Xantham Gum, PhytocellTec (Malus Domestica Fruit Cell Culture Extract, Xanthan Gum, Glycerin, Lecithin, Phenoxyethanol, Water), Gigawhite (Water, Glycerin, Malva Sylvestris (Mallow) Extract, Mentha Piperita (Peppermint) Leaf Extract, Primula Veris Extract, Alchemilla Vulgaris Extract, Veronica Officinalis Extract, Melissa Officinalis Leaf Extract, Achillea Millefolium Extract), Methyl Cellulose, Glycerin, Melatonin, Caffeine, Biotin, Tocopheryl Acetate, Ceramide 3, Squalene, Behentrimonium Chloride, Hydrolyzed Soy Protein, Potassium Citrate. • Vitamin C Serum: Award-winning Vitamin C Serum is a balanced blend of antioxidants that work wonders on sun damaged, aging skin. All Natural Serum is made with Vitamin C, Ferulic and Hyaluronic Acid to help reduce the appearance of wrinkles and discoloration, and prevent photoaging. Revive, tighten and smooth the skin. 1.02 oz. ORDER NOW! • Vitamin A Serum: Vitamin A Serum works to exfoliate the skin, reduce wrinkles, and improve the appearance of sun damaged, aging skin. 1.02 oz. ORDER NOW! Ingredients: Deionized Water, Carthamus Tinctorious (Safflower) Seed Oil, Potassium Cetyl Phosphate, Cocos Nucifera (Coconut) Oil, Phenethyl Alcohol, Caprylyl Glycol, Ethylhexyl Glyc- erin, Sodium Hyaluronate (Hyaluronic Acid), Retinyl Retinoate, Aloe Barbadensis Leaf Juice, Xanthan Gum, Coffea Arabica (Coffee) Fruit Extract, Fragaria Ananassa (Pineberry) Extract, Oat Beta Glucan, Phytoceramide, Steam Distilled Aurantifolia (Lime) Essential Oil, Alpha Lipoic acid, N Acetyl D Glucosamine. • Face Cream: Face Cream is made with peptides and actives to boost collagen production and antioxidants neutralize aging free radicals. Helps reduce the appearance of wrinkles and create smooth, beautiful skin. 1.02 oz. ORDER NOW! Ingredients: Water Deionized, Safflower Oil (Carthamus Tinctorius), Caprylic/Capric Triglycerides, Niacinamide, Matrixyl 3000, Argan Oil, Syn-Tacks, Pomegranate Seed Oil (Punica Granatum), Green Tea Extract (Camelia Sinensis Polyphenols), Grape Seed Extract (Vitis Vinifera), Acai Berry Extract, Sodium PCA, Resveratrol, Potassium Sorbate, Sorbic Acid, Vitamin E Acetate, Coenzyme Co Q10, Tocotrienol 40, Aloe Barbadensis Leaf, Coconut Oil (Cocos Nucifera), Steam Distilled Lime Extract. • Antioxidant Facial Oil: Preservative-free, Antioxidant Facial Oil is truly the most natural way to hydrate and protect against photoaging, fight against free radicals. 1.02 oz. ORDER NOW! • Cream Cleanser: A delightfully, moisturizing Cream Cleanser helps softens and smooths the skin. Helps remove free radicals and impurities, replenishing and calming the skin. 4 oz. ORDER NOW! Ingredients: Deionized Water, Sesame Oil (Sesamum Indicum), Caprylic/capric Triglycerides, Shea Butter (Butyrospermum Parkii), Cetearyl Glucoside, Carrageenan Gum, Vegetable Glycerin, Caprylhydroxamic Acid, Caprylyl Glycol, Sodium PCA, Green Tea (Camellia Sinensis Leaf), Jojoba (Simmondsia Chinensis), Squalene, Organic Macadamia Oil (Macadamia Ternifolia Seed Oil), Organic Jojoba Oil (Simmondsia Chinesis), Yeast Extract, Glucosamine HCL, Vitamin E (Tocopheryl), Sodium Hyaluronate, Algae Extract, Orchid Extract (Orchis Mascula), Titanium Dioxide. WOMEN'S HEALTH/ANTI AGING: Exfoliating Serum, 1.02 oz. WOMEN'S HEALTH/ANTI AGING: Vitamin C Serum, 1.02 oz. WOMEN'S HEALTH/ANTI AGING: Vitamin A Serum, 1.02 oz. WOMEN'S HEALTH/ANTI AGING: Face Cream, 1.02 oz. WOMEN'S HEALTH/ANTI AGING: Antioxidant Facial Oil, 1.02 oz. WOMEN'S HEALTH/ANTI AGING: Cream Cleanser, 4 oz. • Renew Replenishing Night Cream: Renew Replenishing Night Cream helps recover moisture and protect against the early signs of aging. Made with Peptides, Green Tea Extract, clinically proven antioxidant EUK-134, and Amla Extract to leave your skin moisturized and protected. 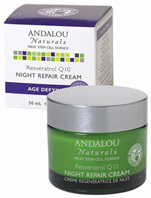 Replenishing Night Cream helps encourage healthy skin cell rejuvenation to maintain skin's youthful look. Helps to moisturize and restore to reveal your softest skin. 1.7 oz. ORDER NOW! Ingredients: Aqua, Aloe Barbadensis Leaf Juice, Glycerin, Palmitoyl Pentapeptide-4, Acetyl Hexapeptide-8, Magnesium Ascorbyl Phosphate, Gama Amino Butyric Acid, Ginseng Extract, Portulaca Oleracea Extract, Centillica Asiatica Extract, Sunflower Oil, Octyl Palmitate, Glyceryl Stearate, Cetearyl Alcohol, Panthenol, Grape Fruit Seed Extract, Tocopherol Acetate, Tocopherols, Flax Seed Oil, Borage Oil, Rosehip Oil*, Squalane, Prunus Persica (Peach) Leaf Extract, Soy Lecithin, Green Tea Extract, Sweet Almond Oil, Allantoin, Dimethicone, Boswellia Serrata Extract, Phenoxyethanol, Ethyl Hexyl Glycerin. • Renew Antioxidant Plus Serum: Renew Antioxidant Plus Serum is made with super fruit, antioxidant Amla Extract and Vitamin E to protect against environmental stress. Organic Aloe and Calendula Extract intensely moisturize. Renew Antioxidant Plus Serum helps prevent the early signs of aging, moisturize and restore to reveal your softest skin. 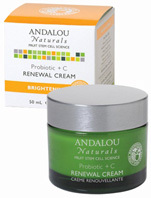 Helps encourage healthy skin cell renewal to maintain skin's youthful look. 1 oz. ORDER NOW! Ingredients: Aqua, Aloe Barbadensis Leaf Juice, Emulsfying Wax Nf , Glycerin, Magnesium Ascorbyl Phosphate, Tocopherol Acetate, Xanthan Gum, Algin, Dipalmitoyl Hydroxyproline, Calendula Extract, Witch Hazel Distillate, Hyaluronic Acid, Ethylbisiminomethylguaiacol Manganese Chloride (EUK-134), Emblica Officinalis (Amla) Extract, Phenoxyethanol, Ethylhexyl Glycerin. • Radiance Brightening Day Lotion SPF 20: Radiance Brightening Day Lotion is made with naturally-derived Peptides, Turmeric Root and Vitamin C is clinically proven to deliver brighter, more glowing skin after just 8 weeks. Intensify the radiance of your natural skin tone. Boost cell turnover for a more even skin tone, and recover skin's moisture barrier for softer and smoother skin. Suitable for all skin types. 1.7 oz. ORDER NOW! Active Ingredients: Titanium Dioxide 1.5%, Zinc Oxide 7.5%. Inactive ingredients: Water (Aqua), Caprylic/Capric Triglyceride, Glycerin, Dimethicone, Carthamus Tinctorius (Safflower) Oleosomes, Cetearyl Olivate, Tocopheryl Acetate, Sorbitan Olivate, Cetearyl Alcohol, Cetearyl Glucoside, Lecithin, Tetrapeptide-30, Aloe Barbadensis Leaf Extract, Camellia Sinensis Leaf Extract, Lavandula Angustifolia (Lavender) Flower Extract, Hexanoyl Dipeptide-3 Norleucine Acetate, Ascorbyl Glucoside, Hydrolyzed Vegetable Protein, Bisabolol, Panthenol, Sodium Hyaluronate, Beta Glucan, Squalane, Allantoin, Maltodextrin, Polysorbate 60, Sclerotium Gum, Tetrahydrodiferuloylmethane, Hydroxyethyl Acrylate/Sodium Acryloyldimethyltaurate Copolymer, Hydroxyethylcellulose, Ethylhexylglycerin, Phenoxyethanol. WOMEN'S HEALTH/ANTI AGING: Radiance Brightening Day Lotion SPF20, 1.7 oz. • Collagen Plus C Liposome Serum: Collagen Plus C Liposome Serum is a skin defense serum that revitalizes the skin with a potent topical antioxidant, protecting against sun and wind to reduce dry skin and wrinkles. Made with Vitamin C, Vitamin E, and phospholipids in a time-release stable liposome form. Collagen Plus C Liposome Serum improves the skin's firmness, elasticity, and moisture. Liposome provides time-released fat-soluble Vitamin C deep into the skin where it boosts the natural production and maintenance of Collagen. Vitamin E helps increase moisture in the skin for a more supple skin, Phospholipids helps to activate cellular metabolism. The most important is Linoleic Acid helps reduce transdermal moisture loss, regulate function of the sebaceous glands, and increase respiratory activity of the skin. Firms skin, improves skin smoothness, and reduces the appearance of fine facial lines. Once or twice daily, gently smooth a few drops of Collagen+C Liposome Serum on clean, dry skin over face and neck. 1.7 oz. ORDER NOW! Ingredients: Purified Water, Phospholipids, Tocopheryl Acetate (Vitamin E), Ascorbyl Palmitate (Vitamin C), Soluble Collagen, Acrylamide/Sodium Acryloydimethyltaurate Copolymer, Isohexadecane, Polysorbate-80, Butylene Glycol, Xanthan Gum, Tyrosine, Proline, Cysteine, Zinc Chloride, Phenoxyethanol. Methylparaben, Ethylparaben, Potassium Sorbate, Propylparaben, Butylparaben. WOMEN'S HEALTH/ANTI AGING: Collagen Plus C Liposome Serum, 1 oz. • Super Polypeptide Lift and Firm Cream: Polypeptides join forces with Advanced Fruit Stem Cells and BioActive 8 Berry Complex for an instant facelift, stimulating circulation, while increasing collagen and elastin to help erase the lines of time for a firmer, smoother, more luminous complexion. For Normal to Dry and Sensitive Skin. 1.7 oz. ORDER NOW! Ingredients: Aloe Barbadensis Juice, Aqua, Helianthus Annuus (Sunflower) Oil, Vegetable Glycerin, Glyceryl Stearate, Octyl Palmitate, Cetyl Alcohol, Glyceryl Monolaurate, Prunus Amygdalus Dulcis (Sweet Almond) Oil, Tocopherol (Vitamin E), Cucumis Sativa (Cucumber) Extract, Palmitoyl Tripeptide-1 and 3, Malus Domestica (Apple), Solar Vitis (Grape) and Vaccinium Myrtillus (Bilberry) Fruit Stem Cell Cultures and BioActive 8 Berry Complex, Magnesium Ascorbyl Phosphate (Vitamin C), Ubiquinone (CoQ10), Bisabolol, Hyaluronic Acid, Allantoin, Borago Officinalis (Borage), Oenothera Biennis (Evening Primrose) and Simmondsia Chinensis (Jojoba) Oils, Resveratrol, Xanthan Gum, Camellia Sinensis (White Tea) and Hibiscus Rosa-Sinensis Extracts,Phenoxyethanol, Ethylhexylglycerin, Agathosma Capensis (Buchu) Oil, Citrus Aurantium Dulcis (Orange) Oil. • Fruit Stem Cell Night Repair Cream (w/ Resveratrol Q10): Resveratrol Q10, Advanced Fruit Stem Cells and BioActive 8 Berry Complex create a potent portfolio of antioxidants to slow cellular damage, stimulating circulation and healthy cell renewal for improved dermal structure and soft, smooth, ageless beauty. For Normal to Dry and Sensitive Skin Types. 1.7 oz. ORDER NOW! Ingredients: Aloe Barbadensis Juice, Aqua, Vegetable Glycerin, Magnesium Ascorbyl Phosphate (Vitamin C), Polysorbate 60, Cetearyl Alcohol, Theobroma Cacao (Cocoa) Butter, Helianthus Annuus (Sunflower) Oil*, Ethylhexyl Palmitate, Hydrolyzed Wheat Protein, Hydrolyzed Soy Protein, Palmitoyl Tripeptide-3, Palmitoyl Tripeptide-1, Malus Domestica (Apple), Solar Vitis (Grape) and Vaccinium Myrtillus (Bilberry) Fruit Stem Cell Cultures and BioActive 8 Berry Complex, Ubiquinone (CoQ10), Resveratrol, Tocopherol (Vitamin E), Linum Usitatissimum (Flax) Oil, Hyaluronic Acid, Borago Officinalis (Borage), Persea Gratissima (Avocado) and Rosa Canina (Rosehip) Oils, Olive Squalane, Fagus Sylvatica (Beech) Extract, Oenothera Biennis (Evening Primrose) Oil,Camellia Sinensis (White Tea), Aspalathus Linearis (Rooibos), and Hibiscus Rosa-Sinensis Extracts, Allantoin, Mangifera Indica (Mango) Butter, Phenoxyethanol, Ethylhexylglycerin, Symphytum Officinale (Comfrey) Extract. • Probiotic + C Renewal Cream: Probiotic microflora boosts immunity, as Advanced Fruit Stem Cells, Vitamin C and potent polypeptides effectively slow cellular damage, stimulating circulation and healthy cell renewal, improving clarity, tone and texture for a fresh, radiant complexion. For Normal and Combination Skin. 1.7 oz. ORDER NOW! Ingredients: Aloe Barbadensis Juice, Aqua, Helianthus Annuus (Sunflower) Oil, Vegetable Glycerin, Glyceryl Stearate, Caprylic/Capric Triglyceride, Magnesium Ascorbyl Phosphate (Vitamin C), Cetyl Alcohol, Glyceryl Monolaurate, Malus Domestica (Apple), Solar Vitis (Grape) and Vaccinium Myrtillus (Bilberry) Fruit Stem Cell Cultures and BioActive 8 Berry Complex, Hydrolyzed Myrtus Communis Leaf Extract, Acetyl Hexapeptide-3, Palmitoyl Tripeptide-1, Ubiquinone (CoQ10), Lycium Barbrum Fruit Extract, Probiotic Complex (Alpha-Glucan Oligosaccharide, Polymnia Sonchifolia Root, Maltodextrin and Lactobacillus), Tocopherol (Vitamin E), Olive Squalane, Allantoin, Hyaluronic Acid, Manuka Honey, Acacia Gum, Calendula Officinalis and Cucumis Melo (Melon) Extracts, Rosa Canina (Rosehip) and Punica Granatum (Pomegranate) Oils, Camellia Sinensis (White Tea) Extract, Resveratrol, Xanthan Gum, Phenoxyethanol, Ethylhexylglycerin, Citrus Aurantium Dulcis (Orange) and Citrus Tangerina (Tangerine) Oils. • Fruit Stem Cell Revitalize Serum (w/ Resveratrol Q10): Highly concentrated Resveratrol Q10, Advanced Fruit Stem Cells and BioActive 8 Berry Complex, create a potent portfolio of antioxidants to slow cellular damage, stimulating circulation and healthy cell renewal for improved dermal structure and soft, smooth, ageless beauty. For All Skin Types. 1.1 oz. ORDER NOW! Ingredients: Aloe Barbadensis Juice, Aqua, Polysorbate 60, Cetearyl Alcohol, Vaccinium Macrocarpon (Cranberry) Juice, Aspalathus Linearis (Rooibos), Hibiscus Rosa-Sinensis Extracts and Camellia Sinensis (White Tea) Extracts, Magnesium Ascorbyl Phosphate (Vitamin C), Vegetable Glycerin, Hyaluronic Acid, Olive Squalane, Hydrolyzed Myrtus Communis (Myrtle) Extract, Acetyl Hexapeptide-3, Helianthus Annuus (Sunflower) Oil, Malus Domestica (Apple), Solar Vitis (Grape) and Vaccinium Myrtillus (Bilberry) Fruit Stem Cell Cultures and BioActive 8 Berry Complex, Ubiquinone (CoQ10), Resveratrol, Tocopherol (Vitamin E), Glyceryl Monolaurate, Borago Officinalis (Borage) and Rosa Canina (Rosehip) Oils, Grapeseed Polyphenols, Linum Usitatissimum (Flax) and Oenothera Biennis (Evening Primrose) Oils, Hippophae Rhamnoides (Sea Buckthorn) Oil, Theobroma Cacao (Cocoa) Butter, Laminaria Digitata (Kelp), Allantoin, Cetyl Alcohol, Glyceryl Stearate, Xanthan Gum, Phenoxyethanol, Ethylhexylglycerin, Citrus Aurantium Dulcis (Orange) Oil. • Omega Glow Facial Concentrate: This 'miracle in a bottle' deeply nourishes with Omega 3-6-9 fatty acids for improved elasticity and dermal support. Fruit Stem Cells and BioActive 8 Berry Complex provide a potent portfolio of antioxidants to slow cellular damage and stimulate healthy cell renewal for a radiant complexion. For All Skin Types. 1.9 oz. ORDER NOW! Ingredients: Helianthus Annuus (Sunflower), Olea Europaea (Olive), Simmondsia Chinensis (Jojoba) and Linum Usitatissimum (Flax) Oils, Malus Domestica (Apple), Solar Vitis (Grape) and Vaccinium Myrtillus (Bilberry) Fruit Stem Cell Cultures and BioActive 8 Berry Complex, Vaccinium Macrocarpon (Cranberry), Camelina Sativa, Borago Officinalis (Borage), Punica Granatum (Pomegranate) and Oenothera Biennis (Evening Primrose) Oils, Camellia Sinensis (White Tea), Aspalathus Linearis (Rooibos) and Hibiscus Rosa-Sinensis Extracts, Citrus Aurantium (Petitgrain) and Geranium Maculatum Oils. • Luminous Eye Serum: Advanced Fruit Stem Cells, polypeptides and Vitamin C, boost collagen and elastin to smooth fine lines and firm dermal structure, as caffeine from green coffee, stimulates circulation, reduces puffiness and helps diminish dark circles. For All Skin Types. 0.60 oz. ORDER NOW! Ingredients: Aloe Barbadensis Juice, Aqua, Vegetable Glycerin, Camellia Sinensis (Green Tea) and Cucumis Sativus (Cucumber) Extracts, Cetearyl Alcohol, Acetyl Tetrapeptide-5, Polysorbate 60, Sodium PCA, Hyaluronic Acid, Magnesium Ascorbyl Phosphate (Vitamin C), Caffeine (Green Coffee), Tocopherol (Vitamin E), Ubiquinone (CoQ10), Malus Domestica (Apple), Solar Vitis (Grape) and Vaccinium Myrtillus (Bilberry) Fruit Stem Cell Cultures and BioActive 8 Berry Complex, Hydrolyzed Soy Protein, Aspalathus Linearis (Rooibos), Hibiscus Rosa-Sinensis and Camellia Sinensis (White Tea) Extracts, Curcuma Longa (Turmeric), Chamomillia Recutita (Chamomile) and Laminaria Digitata (Kelp) Extracts, Allantoin, Phenoxyethanol, Ethylhexylglycerin, Hippophae Rhamnoides (Sea Buckthorn) Oil. • Deep Wrinkle Dermal Filler: Advanced Fruit Stem Cells and Goji glycopeptide, effectively slow cellular damage, boosting collagen and elastin to firm and tighten dermal structure, as capuacu butter reduces skin tension to visibly fill, plump and smooth fine lines. For All Skin Types. 0.60 oz. ORDER NOW! Ingredients: Aloe Barbadensis Juice, Aqua, Vegetable Glycerin, Polysorbate 60, Cetearyl Alcohol, Theobroma Cacao (Cocoa) Butter, Dimethicone, Glyceryl Stearate, Magnesium Ascorbyl Phosphate (Vitamin C), Tocopherol (Vitamin E), Theobroma Grandiflorum (Capuacu) Butter, Firming Complex (Hydrolyzed Myrtus Communis (Myrtle) Extract, Acetyl Hexapeptide-3, Ubiquinone (CoQ10) and Lycium Barbarum (Goji) Extract), Malus Domestica (Apple), Solar Vitis (Grape) and Vaccinium Myrtillus (Bilberry) Fruit Stem Cell Cultures and BioActive 8 Berry Complex, Allantoin, Xanthan Gum, Hyaluronic Acid, Phenoxyethanol, Ethylhexylglycerin, Aspalathus Linearis (Rooibos), Hibiscus Rosa-Sinensis and Camellia Sinensis (White Tea) Extracts. • Apricot Probiotic Cleansing Milk: Advanced Fruit Stem Cells blended with replenishing probiotic complex to boost healthy microflora for improved immunity, as nourishing apricot and borage oils gently loosen and remove make-up and impurities, restoring intracellular moisture. For clean, nourished skin and a restored complexion. For Dry, Sensitive Skin. 6 oz. ORDER NOW! Ingredients: Aloe Barbadensis Juice, Aqua, Helianthus Annuus (Sunflower) Oil, Vegetable Glycerin, Caprylic/Capric Triglycerides, Prunus Armeniaca (Apricot) Oil, Prunus Dulcis (Almond) Milk, Glyceryl Monolaurate, Glyceryl Stearate, Cetyl Alcohol, Malus Domestica (Apple), Solar Vitis (Grape) and Vaccinium Myrtillus (Bilberry) Fruit Stem Cell Cultures and BioActive 8 Berry Complex, Prunus Amygdalus Dulcis (Sweet Almond) Oil, Probiotic Complex (Alpha-Glucan Oligosaccharide, Polymnia Sonchifolia Root, Maltodextrin and Lactobacillus), Magnesium Ascorbyl Phosphate (Vitamin C), Grapeseed Polyphenols, Ubiquinone (CoQ 10), Allantoin, Tocopherol (Vitamin E), Mangifera Indica (Mango) Butter, Hibiscus Rosa-Sinensis Extract*†, Rosa Canina (Rosehip) and Borago Officinalis (Borage) Oils, Phenoxyethanol, Ethylhexylglycerin, Agathosma Capensis (Buchu) Oil, Citrus Aurantium Dulcis (Orange) Oil. • Blossom & Leaf Toning Refresher: Organic aloe vera polysaccharides replenish vital moisture to hydrate, soothe and soften. Fruit Stem Cells and Vitamin C effectively slow cellular damage, stimulating circulation and healthy cell renewal, as uplifting geranium tones for a refreshed, beautifully balanced complexion. For All Skin Types. 6 oz. ORDER NOW! Ingredients: Aloe Barbadensis Juice, Aqua, Panthenol (Pro-Vitamin B5), Tocopherol (Vitamin E), Polysorbate 20, Magnesium Ascorbyl Phosphate (Vitamin C), Aspalathus Linearis (Rooibos) Extract, Hibiscus Rosa-Sinensis and Camellia Sinensis (White Tea) Extracts, Ubiquinone (CoQ10), Malus Domestica (Apple), Solar Vitis (Grape) and Vaccinium Myrtillus (Bilberry) Fruit Stem Cell Cultures and BioActive 8 Berry Complex, Phenoxyethanol, Ethylhexylglycerin, Citrus Aurantium (Petitgrain) and Geranium Maculatum Oils. WOMEN'S HEALTH/ANTI AGING: 0.60 oz. WOMEN'S HEALTH/ANTI AGING: 6 oz. • The Amazing 30 Facial Lotion: Rich, anti-aging and multi-tasking Amazing 30 Lotion provides instant hydration and long lasting moisture. Made with 30 of the best natural and organic botanical ingredients for the skin to help nurture your skin tone and texture for visible results. Fortified with Omegas 3, 6, 7 & 9. Blended with high active botanicals, essential oils, exotic butters, hi-value vitamins and plant stem cells, and Cold pHusion for naturally active formulas and superior results. Feel and see the benefits in just 12 hours. 4 oz. ORDER NOW! Ingredients: Water (Aqua), Organic Aloe Barbadensis (Aloe Vera) Leaf Gel, Organic Cocos Nucifera (Coconut) Water, Aspalathus Linearis (Rooibos) Leaf Extract, Glycerin (Kosher), Vitis Vinifera (Grapeseed) Oil, Organic Cocas Nucifera (Coconut) Oil, Prunus Dulcis (Almond) Oil, Simmondsia Chinensis (Jojoba) Esters, Propanediol (Corn), Plukenetia Volubilis (Sachi Inchi) Oil, Argania Spinosa (Argan) Oil, Astrocaryum (Murumuru) Seed Butter, Glyceryl Oleate, Squalene (Olive) Oil, Hippophae Rhamnoides (Seabuckthorn). • The Amazing 30 Facial Creme: Offers quick hydration and long lasting moisture with the 30 very best all-natural ingredients. Made with high active botanicals, essential oils, exotic butters, hi-value vitamins, and plant Stems Cells, Cold pHusion technology for exclusive, naturally active formulas. Experience the difference in just 12 hours. Apply to face, neck, décolleté and other dry areas for moisture, morning and night. Can be used under makeup. 2 oz. ORDER NOW! Ingredients: Water (Aqua), Organic Aloe Barbadensis (Aloe Vera) Leaf Gel, Organic Cocos Nucifera (Coconut) Water, Aspalathus Linearis (Rooibos) Leaf Extract, Glycerin (Kosher), Vitis Vinifera (Grapeseed) Oil, Prunus Dulcis (Almond) Oil, Simmondsia Chinensis (Jojoba) Esters, Prunus Armeniaca (Apricot) Kernel Oil, Organic Persea Gratissima (Avocado) Oil, Propanediol (Corn), Plukenetia Volubilis (Sachi Inchi) Oil, Argania Spinosa (Argan) Oil, Oenothera Biennis (Evening Primrose) Oil, Oryza Sativa (Rice) Bran Oil, Glyceryl Oleate, Squalene (Olive) Oil, Hippophae Rhamnoides (Seabuckthorn) Oil, Organic Rosa Rubiginosa (Rose Hip Seed) Oil, Borago O cinalis (Borage) Oil, Cetearyl Alcohol, Vaccinium Macrocarpon (Cranberry) Oil, Punica Granatum (Pomegranate) Seed Oil, Glyceryl Stearate, Cucurbita Pepo (Pumpkin) Seed Oil, Organic Linum Usitatissimum (Flax Seed) Oil, Salvia Hispanica (Chia Seed) Oil, D-Alpha Tocopherol (Vitamin E), Tocopheryl Acetate (Vitamin E)(25,000 I.U./450g), Sodium Ascorbyl Phosphate (Vitamin C), Ascorbic 2-Glucoside (Vitamin C), Panthenol (Pro Vitamin B-5), Thioctic Acid (Alpha Lipoic), Allantoin, Retinyl Palmitate (Vitamin A), Avena Sativa (Oat) Kernel Extract, Potassium Hydrolyzed (Oat) Protein, Boswellia Carteri (Frankincense) Oil, Sodium Hyaluronate, Malus Domestica (Swiss Apple) Fruit Cell Culture Extract, Argania Spinosa (Argan) Sprout Cell Extract, Caprylhydroxamic Acid & Caprylyl Glycol.